Social Location Services Not Catching Fire in the U.S. Despite the ongoing social networking war--with millions of users flocking to either Facebook, Twitter, or Google+--the top favorite online activities still seem to be the basics: search and email. At least, this is one of the findings announced in a report released Tuesday by the Pew Internet and American Life Project. Based in information gathered in April and May 2011, the report shows that an unsurprising 92 percent of online adults use search engines to find information on the Web (59 percent do this every day). Similarly, 92 percent of online adults use the Web to check email, and 61 percent perform this task daily. "Since the Pew Internet Project began measuring adults' online activities in the last decade, these two behaviors have consistently ranked as the most popular," Pew says. 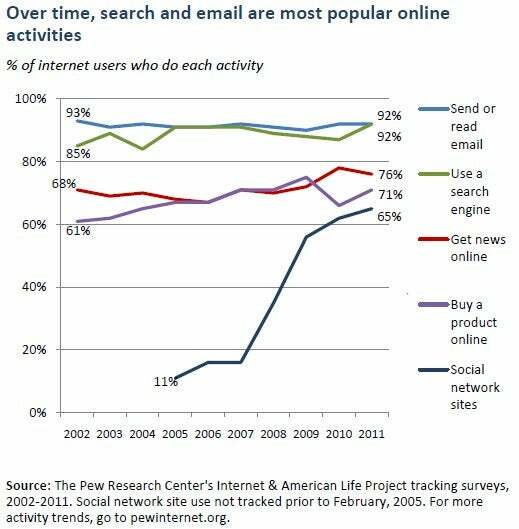 "Even as early as 2002, more than eight in 10 online adults were using search engines, and more than nine in 10 online adults were emailing." While the growth of search and email as favorite activities has remained constant over the years, their use has grown more habitual over the last decade, the report says. "Perhaps the most significant change over that time is that both activities have become more habitual," it notes. "Today, roughly six in ten online adults engage in each of these activities on a typical day; in 2002, 49 percent of online adults used email each day, while just 29 percent used a search engine daily." Social networks fit into this equation, too. Though the popularity of search and email has remained steady since 2002, the allure of social network sites has skyrocketed since appearing on the Pew radar in 2005. In 2005 just 11 percent of adults included social networks in their online activity, and now 65 percent of adults include socnets. The report, which is based on surveys conducted with 2257 adults (aged 18+), notes that, for a technology as long in the tooth as search happens to be, the activity is popular at both ends of the age spectrum. Some 96 percent of young adults (18-29) use search engines, while 87 percent of older adults (65+) also use search engines. However, while 66 percent of young adults use search engines on a daily business, only 37 percent of older adults do so. Pew also finds that search usage climbs as income increases. Ninety percent of households with less than $30,000 in income have used search, while 91 percent of households with an income of $30,000 - $50,000 have used search, and 98 percent of households with an income of $75,000+ have used search. The findings for email are similar: 94 percent of young adults have used email, while 87 percent of older adults have done so. Older adults are more likely to use email daily (46 percent) than they are to use search engines. Ethnic usage trends discovered by the pollsters were also revealing. For example, whites were more likely to use email every day (63 percent) compared to Hispanics (53 percent) and African Americans (48 percent), the report said.